A little birdy in a tree just told me the RCN is formally moving ahead with trying to change its NCM rank insignia back to a more Pre-unification style. I know many will bemoan this and state that we need other things first but I strongly support this "adjustment". I'm rather surprised by that. I support it, but never thought it would happen. I wonder if the above mentioned insignia will be above straight chevrons (somewhat like the sea cadets)? I would've assumed that any change in rank would involve chevrons as that would make things a bit easier for other elements to recognise the ranks (and what they're equivalent to). But I suppose with the change to the Army officer ranks, there doesn't need to be a direct correlation between the ranks of the Army, AF, and Navy anymore. The question remains, will the non-CPOs were a large trade badge on the right sleeve of the DEU (with rank devices as posted above on left sleeve)? Intriguing. It's sort of back to RN / pre-unification RCN -- but not quite...! The suggested sequence of insignia doesn't really make much sense to me; the laurels for the MS didn't seem quite right for a relatively junior rank when I first read it and, having drawn it out, it still looks wrong next to the two plain crossed anchors for PO2. Being me, I have therefore dreamed up a couple of alternatives that I think will work rather better. The key change is that the two PO ranks both have the Crown as an integral part of their insignia, thus making them very obviously different to the more junior NCMs. I've drawn these out as RN-style "tombstone" patches for wear on formal uniforms but I guess they would work just as well on slides for working dress. There are other possible alternatives, incorporating gold chevrons that would show more obvious parallels to the equivalent grades in the other branches of the Canadian Forces but it rather sounds like they're not planning to go that way. The idea being that the single Fouled Anchor for LS gains a laurel wreath with promotion to MS and, similarly, the Crown and Crossed Anchors of PO2 gains a laurel wreath with promotion to PO1. There are lots of options that can be achieved by mixing and matching the various components but, overall, I think it still works best if there's some sort of obvious distinction between the two PO grades and the other NCMs. 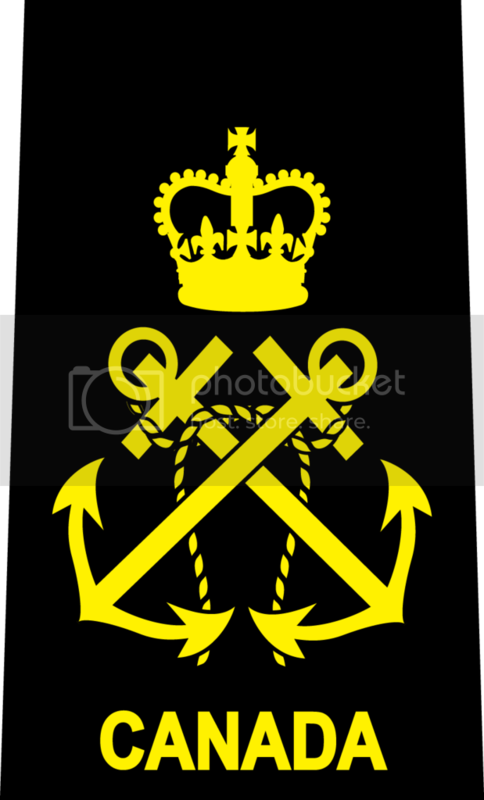 I'm assuming that all these would be worn *above* the elbow on formal uniforms (whether double-breasted jackets or traditional "seaman" sailor uniforms), whereas the RCN Chief Petty Officer 1 and 2 (and senior appointment badges) will continue to be worn below the elbow on the forearm like Army Warrant Officer insignia. Yes, rank slides would be used in the summer when short sleeve shirts are worn (and on work dress), but there would have to be large sized rank insignia used on the sleeves of the double breasted service dress jacket. That would replace the current army style chevrons used on both sleeves, but I can't see them using the anchor devices on both sleeves (that's why I thought they might consider going very retro and bringing back the large trade badges to be worn on the right sleeve as well). I was also wondering about the MS rank. Is it supposed to be an anchor surrounded by a laurel wreath (which is what comes to mind first)? It could possibly be similar to the appointment insignia of the CPO of the Navy and have 2 crossed laurel branches under the anchor (I realise that probably is a long shot, but you never know). Just a thought. Medic, I agree with you that there should be better transition between the MS and other ranks. Older ideas that I had, used a maple leaf above both the MS anchor and the PO2 crossed anchors (but I suppose that would look to similar to the trade badges which have a maple leaf above the trade devices). I guess the problem here is that they want to keep the insignia as traditional as possible, so that would mean only 2 crossed anchors for PO2. As MS is only an appointment (officially, but in practice treated like a substantive rank) maybe thinking the laurels might look like the ones in the CPON appointmen insignia might not be that crazy of an idea. One other thought. Traditionally PO1 rank was worn above the elbow (left sleeve) as it was equivalent to SSGT. Now the rank is equivalent to WO, so the question is will it be worn above the elbow as per tradition, or below the elbow (on both sleeves) as the WOs? The original RN PO2 was a crown above a single anchor -- which would also work in this sequence, especially if you then used a single maple leaf above the anchor for MS (also reflecting the maple leaf as the distinction between Corporal and Master Corporal). As you say, the other obvious alternative is to have a maple leave above the single anchor for MS and then also above the crossed anchors for PO2 and the crown above crossed anchors for PO1. Either of these sequences would work well and has much better progressive sequence that that currently suggested. The advantage to this version it that it also reflects the maple leaf above the three chevrons for sergeant and keeps the crown as a specific emblem for the PO1 grade and its equivalence to the Army / RCAF WO grade. From the pictures, I think last version is probably the best overall compromise if the ranks are all to be worn on the sleeve above the elbow. If PO1 is to be worn on the forearm then I really don't see the point in changing it from the plain crown, the same as the Army / RCAF WO insignia. One other sequence I thought about would be using the de facto MS from the late '60s to early '70s that was used before the square rig was completely phased out and replaced with the single green uniform. Some MS sewed a crown above their LS anchor to differentiate themselves. So the sequence would be; single anchor, single anchor and crown, crossed anchors, crossed anchors and crown. That would work well, but it's possible that for the "new" traditional ranks they only wanted the crown to be used for PO1 (though a naval crown could be substituted for the royal crown in the MS insignia if that's the case). BTW, I agree with you Medic, the last row looks the best. Torg003 wrote: One other sequence I thought about would be using the de facto MS from the late '60s to early '70s that was used before the square rig was completely phased out and replaced with the single green uniform. Some MS sewed a crown above their LS anchor to differentiate themselves. So the sequence would be; single anchor, single anchor and crown, crossed anchors, crossed anchors and crown. That would work well, but it's possible that for the "new" traditional ranks they only wanted the crown to be used for PO1 (though a naval crown could be substituted for the royal crown in the MS insignia if that's the case). I was thinking the same thing about master seaman; it adds a certain symmetry to the ranks. 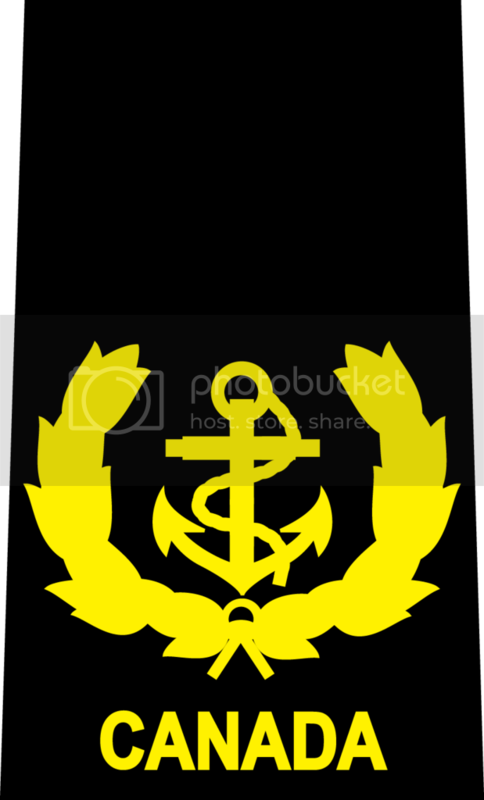 Based on the Canadians using two CPO ranks, the proposed master seaman rank as depicted screams CPO Second Class to me. That being said, I wonder if there's going to be a further realignment of the Canadian forces that continues the re-Britification. If so, I wonder if the master corporal and seaman appointments will be removed? I doubt that MS and Mcpl will be removed because that would require an overhaul of the National Defense Act so (not impossible but) very unlikely. Personally I wouldn't mind seeing Lcpl brought back and use a single chevron with a maple leaf, while keeping the current Mcpl rank but just calling it Cpl. That would also eliminate the problem of having to make up a traditional looking rank for MS as it would go back to being LS with a fouled anchor insignia. 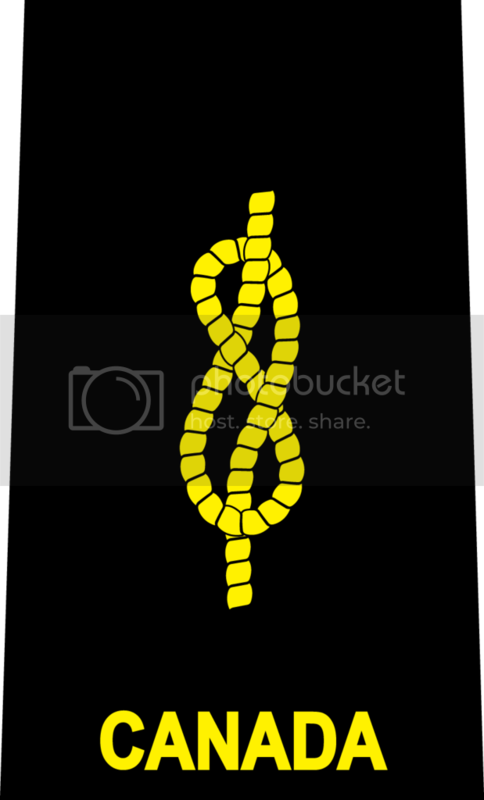 Though you'd probably have to have 2 classes of AB (AB1 using the knotted rope and AB2 with no insignia). Like I said, not likely to happen. Torg003 wrote: I doubt that MS and Mcpl will be removed because that would require an overhaul of the National Defense Act so (not impossible but) very unlikely. Ah, didn't know it was set in legislation. Well, for the two ABs one could always use both versions of the insignia. 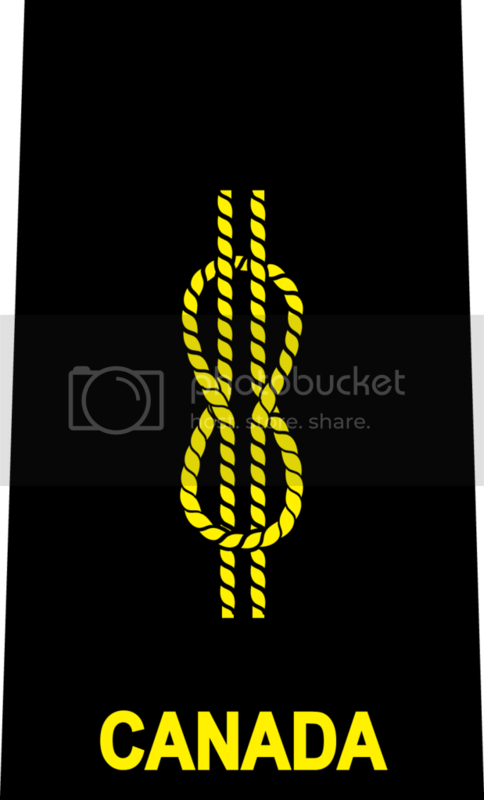 The single rope version for the lower class and the double for the upper class. As I think on the MS issue, I'm thinking a wreath of maple leaves in lieu of the laurels would work, though the maple leaf would be my preference. I think using wreath of maple leaves instead of laurels might look a bit reminiscent of the insignia of the CFCWO (a ring of maple leaves around the Canadian coat of arms), actually it would look closer to the officer's hat badge minus the crown. 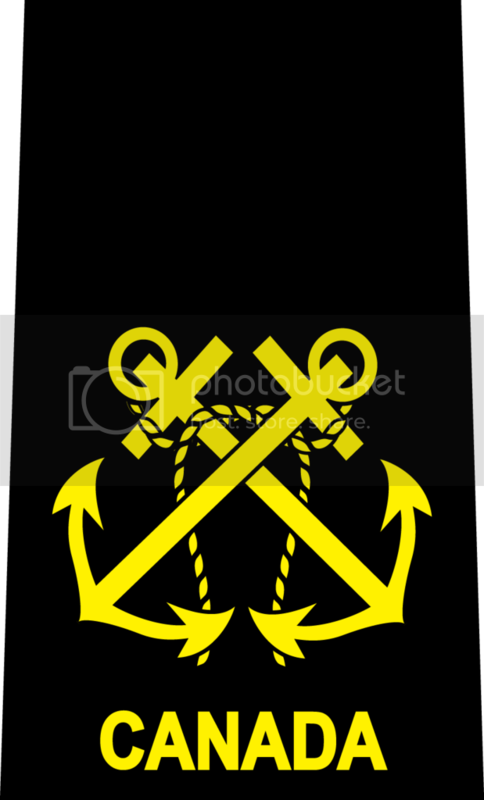 A single maple leaf above or possibly superimposed on part of the anchor (such as the top) would be the best. Wish the CAF would come out with some sort of announcement soon so we could see what the MS insignia will look like. instead of a maple leaf, you could have a six point star above the anchor. would fit with rating specialist badges. marcpasquin wrote: instead of a maple leaf, you could have a six point star above the anchor. would fit with rating specialist badges. Not sure if you're being serious, sarcastic, or trying to be humorous. You know that RCN trade badges (rating specialist badges) have a maple leaf above them, it's the RN that has the six pointed star (or is that the point you are trying to make, you think that changing back to old style RCN ranks makes them look more "British"?). Torg003 wrote: is that the point you are trying to make, you think that changing back to old style RCN ranks makes them look more "British"?. the point of the excercise was to return the insignias worn to their british roots so yes, even though I don't agree with the move, it would make sense to me to do so. It therefore makes perfect sense that the (unofficial) insignia for MS, as noted by Torg003 above, was the single Fouled Anchor surmounted by a crown (like the obsolete RN PO2). The pattern of changing insignia for each group of rates, with the senior grade of each pair being indicated by the addition of a Crown above the basic rate insignia does at least have a logical sequential progression. That being the case, I wonder why they don't just go back to this system in its entirety, with the addition of formally including the single anchor + crown for the MS rank, and also re-instating the cuff buttons back on the CPO uniforms, especially given that they would only really appear on the blue formal jackets and the slides would remain as the Arms for CPO1 and Crown-in-wreath for CPO2. There is one other thing that hasn't been discussed: the Army and RCAF equivalents deliberately ditched the Staff / Flight Sergeant rank titles (and their insignia of Crown over three chevrons) and re-roled these grades to create three Warrant Officers ranks instead. The same happened in the naval branch but the rank title didn't change. This has been established for many years now, so to see it through to its logical conclusion and set a proper parity, it would seem far more sensible to have a proper parallel in the naval rates going forward that was reflected in both the insignia and rank titles: if the Army / RCAF NCMs stop at sergeant and then have three Warrant Officer grades, surely it would make more sense to match this by having the RCN ranks stop at Petty Officer and then have three CPO grades...? If the Army/RCAF have Warrant Officer, Master Warrant Officer and Chief Warrant Officer then, ideally, this would be matched with the RCN ranks but that hits an obvious snag with the senior title in that "Chief Petty Officer" and then "Master Chief Petty Officer" would work fine for the first two grades but "Chief Chief Petty Officer" is not so great...! Additional marks for senior CPO appointments as per current insignia. That, to me, would be the most sensible solution. It is the best compromise between re-introducing the "traditional" insignia and also re-aligning them to better reflect the reality of the contemporary grade structure -- and if the RCN is going to change its NCM insignia then this would be the opportunity to achieve both those things. I admit that the CPO rank titles would still need a bit of thought, although simply numbering them CPO3 through CPO1 is a perfectly functional way of doing it. I'm away from home so not able to draw this sequence but I think it's obvious enough that you can picture what it would look like without the images. Hopefully I can get around to those later...! Medic, you are correct. The RCN pre-unification (during the '50s and '60s) added an additional rank for PO and CPO to make the RCN ranks correspond better to army and AF ranks (then army/AF had 2 grades of SGT and 2 classes of WO). The insignia you list is correct. AS the RCN already changed it's rank structure to better reflect the rank structure in the other services, there was (and is) no need to follow the example of the RN and adopt WO ranks (and thus downgrading the CPO rank). I came to pretty much the same conclusions as you, have only one PO (as there is only one SGT rank now) and 3 CPOs (to reflect the 3 grades of WOs). I fooled around with different ideas but the rank insignia was pretty much the same as you listed. I had thought maybe 3 classes of CPO might be a bit much (especially having only one PO), so one variant had the PO1 become Senior PO (therefore all WO grade rank equivalents have a prefix, either senior or chief). I also thought that maybe the top rank that has the coat of arms insignia might be changed to a naval Warrant Officer (WO(N)) and bump the CPO1&2 down one grade (crown in wreath and single crown). Also thought bought the Master CPO being same as a MWO and thought could use WO(N) as top rank as well (as you stated, Chief CPO doesn't work, and couldn't come up with another title that didn't sound silly or contrived). One other idea was to just add Master to the 2 CPO ranks, so having a MCPO1 and MCPO2 instead of CPO1 and CPO2 (PO1 would be CPO of course). Some Caribbean countries (as well as India) use this (2 classed of Master CPO) instead of 2 WOs like the RN. It would also reflect what happened in the junior ranks during unification, the LS rank was downgraded when AB were all promoted to LS (just as Lcpls were all promoted to Cpl) and the original LS became MS. MCPO1&2 would be the same in that they would be the original CPO ranks before CPO was downgraded (originally PO1). Just wanted to add, I doubt that there will be any adjustment to the traditional rank titles (other than MS) as I think it would've been down in the '80s when the DEUs came in and the separate navy rank titles were made official. Though it would make logical sense to do it now if they are indeed changing the insignia, it seems as though the RCN is keen on keeping its own unique traditional rank titles (different than RN) even though they don't really match up well with the current CAF rank structure. Considering they've been using them officially for the past 30 years, and unofficially for more, without complaint, doesn't seem like they care if they fully reflect the army or AF ranks. Though it is interesting to speculate what that would be if they did. Yeah, I tend to agree -- the RCN (or the maritime component as was) has had plenty of prior opportunities to adjust their rank titles over the last twenty to thirty years, should they have so wished so I can't see them suddenly deciding to do it now, even if it would probably make more sense in terms of parity of the relevant grades with the other branches! Although, if they were going to do it, a change like this would probably be the opportune moment. If the rank titles remain unaltered then the only other obvious distinction would be to use the ranks markings we seem to have both reached independently, as above, but simply omit the cuff buttons for PO1 on the formal uniform (the soft shoulder slides will work for all grades with the insignia as described). This broadly retains the insignia parity between the RCN PO1s and CPOs and the WO / MWO / CWO of the other branches (probably the more important aspect of all this) but keeps a subtle distinction between PO and CPO ranks (if one were needed -- although if not, then why not simply go to three CPO grades to match the three WO grades...?). Senior CPO appointments as per current insignia, above three cuff buttons. Again, at least this way there is a logical progression an the "new" RCN insignia will be relatively easy to work out for NCMs of other branches unfamiliar with the historical RCN insignia. I wonder how long it will be before someone decides to replace the maple leaves on the Army / RCAF insignia for MCpl and Sgt with Crowns...?! If they really do want to include the PO1 in this change then one reasonable option would be to take the insignia from the bottom row of illustrations in the image in my first post and swap the MS Anchor-in-laurel for the single Anchor + Crown. This still gives a decent logical sequence and, even thought the PO1 insignia would be rather different from the cuff Crowns of the Army / RCAF WOs, this would at least still give the PO1 a distinctly different insignia that looks suitably "senior" to the other NCMs, whilst retaining the existing cuff insignia for CPOs. I'll be interested to see what the final "official" version of all this looks like when it's formally announced. I really do hope they re-think the proposed insignia for MS as the Anchor and laurels just looks so out of place with the rest of the system. Speaking of the RCMP, I wonder if the 'laurel' that was mentioned for the MS rank/appointment would have one of the staff sergeant major's laurels, if not a simple swapping of the crown for the anchor? It would at least be somewhat distinct. Anyone have anymore info on this? Been a few weeks and nothing new. Have to wonder if the original post on the military forum was just an attempt to stir things up a bit (which did work, most people posting how it was a waste of money, etc.) or if it really has a basis in fact? You'd think that with the election coming up in a couple of months (or so), that the gov't would want to get this done before then (assuming they are actually planning on doing it). That's the nature of the CF forum. There will be a post that gets a flurry of replies for a couple of days, and then it goes quiet for a few weeks until the next bit of detail gets leaked. Doesn't look like we'll get any more leaked info unless it's posted directly here as the thread on the Canadian military forum has just been locked. We'll probably have to wait to see if there's an official announcement sometime in the future. Oh, it's been locked many times in the past, and then after a spell, it gets unlocked. Nothing too worrisome there.